Beth is a freelance playwright and theatre director who originally trained as an actress at Birmingham Conservatoire after studying English Literature at Durham University. Her play The Glove Thief, commissioned by Tonic, is published by Nick Hern Books. She is an Associate Artist at Reading Between Lines Theatre Company, for whom she has written Henry I of England, Oscar Wilde on Trial, Matilda the Empress and Henry II. Other writing this year includes: Polstead for Eastern Angles, an adaptation of The Rivals for The Watermill Theatre, The Rebellious Women of Wimbledon for Attic Theatre Company, Finding Victoria, a site specific theatre piece in development for Kensington Palace, and Genomes for RBL. Her play and theatre installation on Greenham Common, Greenham: One Hundred Years of War and Peace was watched by eight thousand people across two days in 2017. 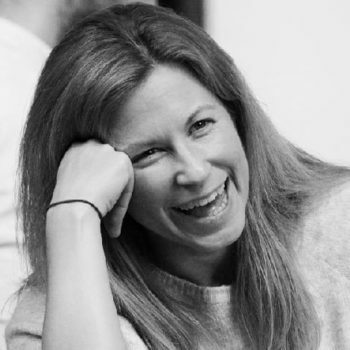 She has collaborated twice as writer/director with physical theatre ensemble Rhum and Clay, on Jekyll and Hyde and Hardboiled: The Fall of Sam Shadow which toured with The Watermill before transferring to New Diorama in London (Off West End Award Nominee for Best Director 2016). Her play The True History of Susanna Shakespeare was awarded a Tenancy at Nuffield Theatre Southampton and longlisted for the Papatango Prize in 2017. As the former Outreach Director at The Watermill she worked on many productions as writer, director or both, including David Copperfield, Life Lessons, Writers’ Block, The Girl Who Never Forgot, Hamlet, Macbeth, Romeo and Juliet, Othello and Doctor Faustus. Beth is working on a theatrical adaptation of Jonathan Porritt’s book The World We Made, in which he presents a credible, positive vision of our planet that is green, fair, connected and collaborative. Part history, part personal memoir, The World We Made reveals how it is possible to reach a genuinely sustainable world by 2050; describing the key events, technological breakthroughs and lifestyle revolutions that will transform our planet. The play will be performed in theatres and other venues in 2019. Support from CUSP will enable Beth to spend time working on the script and gain advice and support in interrogating the issues involved in creating a sustainable planet, so that it can be presented in an accessible way to a popular audience.